Yes, this is vandalism and should be punished, but c’mon… aren’t you kind of rooting for them? Speed cameras are just a revenue-generating abuse by government. Criminal behavior by protesters, like destroying property, trespassing, assault, etc., should be vigorously punished. Forcing people to get a permit from government in order to protest government is an old tool of an oppressive government. French Prime Minister Edouard Philippe has announced plans to punish people who hold unsanctioned protests after seven weeks of anti-government unrest. His government wants to draft new legislation that will ban troublemakers from protests and clamp down on the wearing of masks at demonstrations. He said 80,000 members of the security forces would be deployed for the next expected wave of protests. Protesters smashed down the gates to a government office this weekend. In other chaotic scenes in Paris, demonstrators fought riot police, and cars and motorbikes were burnt. It was the most important TV appearance of Emmanuel Macron’s presidency: the 40-year-old former banker had to prove to an angry nation that he was not an arrogant “president of the rich” and that he understood ordinary French people’s struggle to make ends meet. Yet Macron’s choice to deliver his prerecorded speech on social inequality from one of the most opulent and golden rooms in the luxurious, 365-room Élysée Palace was not lost on gilets jaunes protesters who have been occupying protest barricades on rural roundabouts. Indeed, the Élysée Palace, the French presidential residence and workplace that is twice the size of the US White House and costs €104m a year to run, has been the object of fury during the protests. The demonstrations, which began as a citizens’ revolt against a proposed fuel tax on 17 November have quickly morphed into wider anti-government demonstrations against inequality. Macron chose to announce his measures aimed at calming the gilets jaunes protests by speaking from the traditional presidential office known as the salon doré, with its gold decorations. He sat behind the large antique desk that has been used by all presidents since Charles de Gaulle and is the most valuable piece of furniture in the gilded palace. At the edge of the frame was a golden cockerel, the symbol of France, between golden lamps, and three carefully placed antique books. Behind him, just to the right of a pair of ornate gold leaf doors, were the French and European flags. Of course, now the anarchists have joined in with the legitimate protesters. PARIS (AP) — Paris tourist sites reopened, workers cleaned up broken glass and shop owners tried to put the city on its feet again Sunday, a day after running battles between “yellow vest” protesters and police that left at least 71 injured in the French capital and caused widespread damage in cities around France. The man at the focus of protesters’ anger, President Emmanuel Macron, broke his silence to tweet his appreciation for the police overnight. However, pressure mounted on him to propose new solutions to calm the anger dividing France. Macron will address the nation “at the very beginning of the week,” government spokesman Benjamin Griveaux said Sunday, without specifying a day. “This is a catastrophe for commerce, it’s a catastrophe for our economy,” Bruno Le Maire said Sunday while visiting merchants around the Saint Lazare train station, among areas hit by vandalism as the pre-Christmas shopping season got underway. The movement began as a protest against a rise in duties on diesel, which is widely used by French motorists and has long been less heavily taxed than other types of fuel. Diesel prices have risen by about 23% over the past 12 months – and Mr Macron’s decision to impose a tax increase of 6.5 cents on diesel and 2.9 cents on petrol from 1 January enraged protesters. Mr Macron had blamed world oil prices for three-quarters of the price rise, but said higher taxes on fossil fuels were needed to fund renewable energy investments. Um, I don’t know what world Macron lives in, but world oil prices are low. Protesters from France’s “gilet jaunes” (yellow vests) movement have pulled out of a meeting with PM Edouard Philippe scheduled for Tuesday. Some members of the group said they had received death threats from hardline protesters warning them not to enter into negotiations with the government. The “yellow vests” have been protesting about a controversial fuel tax since mid-November. But the protests now reflect more widespread anger at the government. Three people have died since the unrest began and the resulting violence and vandalism – notably when statues were smashed at the Arc de Triomphe last Saturday – have been widely condemned. Britain is going to have to strengthen its defenses if the French are going to be this belligerent after Brexit. 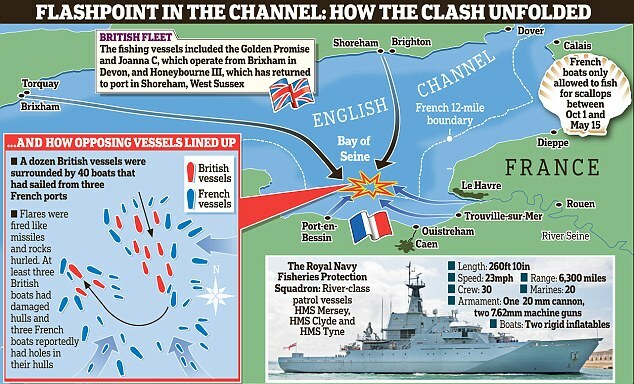 Rocks, smoke bombs and other projectiles are reported to have been hurled at English and Scottish vessels during the confrontation in the early hours of Tuesday morning. French fisherman are angry about a domestic ban preventing them from harvesting the scallop-rich region while British boats are free fish. ‘It is clear that we have insufficient ships to patrol the United Kingdom’s territorial seas and our Exclusive Economic Zone (EEZ),’ Lord West wrote in the Daily Telegraph. ‘Co-ordination of the few ships we do have is fragmented. In theory, co-ordination is exercised by the co-located Joint Maritime Operations Command Centre. When Britain leaves the EU it will be responsible for patrolling its EEZ, rather than being part of a shared EEZ for the whole of the bloc. EU members’ access to British fishing waters will then need to be negotiated as part of a Brexit deal. French authorities try to preserve scallop stocks by banning their ships from fishing in the region over the summer, a measure that ends on October 1. This law does not apply to the British, however – who anger the French mariners by harvesting scallops during this window. Heh. The headline says “macho,” but I’m not sure that is allowed to be use to describe the French. Paris (AFP) – French Prime Minister Edouard Philippe has clamped down on attempts to make French more female-friendly, issuing a ban on so-called “inclusive writing” in official texts, according to a memo seen by AFP on Tuesday. Moves to end the linguistic dominance of the masculine over the feminine have sparked impassioned debate in France, coming as a flurry of revelations about sexual harassment and assault continue to dominate global headlines. At the centre of the row is the growing use of formulations to embrace both genders in the plural form, which requires full-stops being inserted in the word — to the horror of purists. (CNN) Leading French presidential candidate Emmanuel Macron has been the victim of a “massive and coordinated hacking operation,” after files purporting to be from the campaign were posted online via social media, his campaign said Friday. This does seem to be an ongoing tactic by anarchists and malcontents. Campaigns are going to have to go back to doing everything in person in smoky back rooms. The 35-hour week remains in place, but as an average. Firms can negotiate with local trade unions on more or fewer hours from week to week, up to a maximum of 46 hours. Firms are given greater freedom to reduce pay. The law eases conditions for laying off workers, which is strongly regulated in France. It is hoped companies will take on more people if they know they can shed jobs in case of a downturn. Employers to get more leeway to negotiate holidays and special leave, such as maternity or for getting married. These are currently also heavily regulated. And these aren’t unusual statistics. The stagnant growth and unemployment are persistent. It will be interesting to watch how France goes. Apparently, many French like their economy this way. If you’re a 55-year-old Frenchman with a job, why wouldn’t you? It’s almost impossible to get fired, you only work a maximum of 35 hours a week, the pay is good, and the public services are good. What do you care about the 20-year-old who can’t get a job or general economic performance? You got yours. For now. (CNN) French fighter jets bombed a series of ISIS sites in Raqqa, Syria, on Sunday in what officials described as a major bombardment. The targets included a command center, a recruitment center, an ammunition storage base and a training camp for the terror group, said Mickael Soria, press adviser for France’s defense minister.